The MICA Kiosk was an interactive outreach campaign/student design project in collaboration with MICAs Social Design Program. 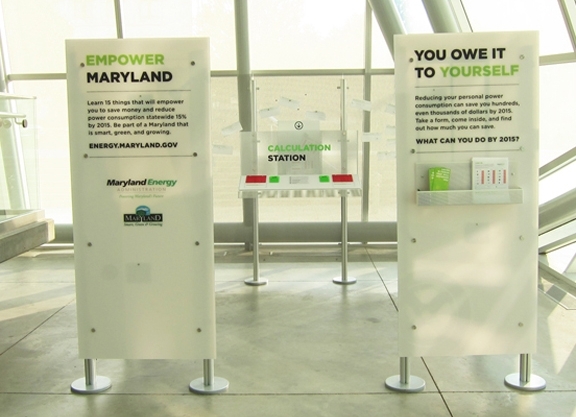 In 2010, The Maryland Energy Administration engaged MICA to help them promote their 15x15 campaign – 15 ways to save 15% on your energy bill by the year 2015. The recently developed MICA Design/Build class worked with the Social Design program at MICA to develop a travelling kiosk to promote the campaign statewide. The Social Design program at MICA is a graduate level graphics program that analyzes how information graphics and branding can be used to improve the social condition… so they were heavily involved in getting the MEA to visualize their campaign before our design/build students became involved. They developed the branding and graphics for the campaign, which started the ball rolling through a series of bus decals and billboard advertisements used throughout the state. The design/build group got engaged in the project when the MEA proposed the idea of targeting a campaign specific to universities and students. We looked at different ways a traveling exhibit could take shape. The exhibit went out to about 25 different universities statewide. The Kiosk utilizes 3-Form acrylic panels and a custom pipe and rail system for an interactive user experience. By responding to a few simple questions related to saving energy, a user could learn how much they would save in a single year when following certain energy-saving tips. At the end, they added up all of their savings and were asked how they would spend the money saved. Interactive modes of engagement are influential to behavioral practices… often leading to simple ways people can improve themselves and their lives.